“FUNERAL, n. A pageant whereby we attest our respect for the dead by enriching the undertaker..."
The most fascinating story in Brian Parsons’ book is of the extraordinary shenanigans at the death of the celebrated illusionist, the Great Lafayette. Born Sigismund Neuberger in Munich in 1871 Lafayette emigrated with his Jewish family to the United States when he was 19. He took to the stage, initially as a professional quick change artist but slowly started to incorporate magic tricks into his act. He became close to another struggling magician on the vaudeville circuits, Erik Weisz, who later became better known by his stage name, Harry Houdini. 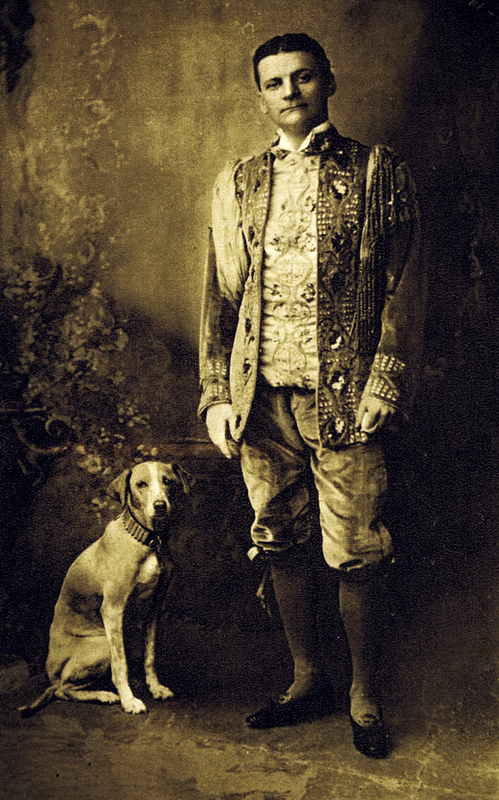 It was Houdini who presented Neuberger with the love of his life, a little dog called Beauty who completely reciprocated her masters feelings and couldn’t bear to be parted from him, even when he was on stage. Lafayette made her a fixture of his act, teaching her small parts in his magic routines and with Beauty at his side success suddenly came to the magician and he became one of the biggest box office draws in America. Neuberger moved to London, where he set up home in swish Tavistock Square and became the highest paid magician on the circuits, earning £40,000 a year, taking bookings up to ten years in advance and employing a team of 40 to help stage his elaborate illusions. Despite the many temptations that women offer the hugely successful man, Beauty remained his one true love. Outside his house hung a plaque declaring “the more I see of people, the more I love my dog.” And inside the house visitors were greeted with more printed encomiums ‘you may eat my food, you may command my servants, but you must respect my dog’. An unshakeable rule of tragedy is that all great loves are doomed and so it proved for Neuberger and Beauty. In 1911 Neuberger was in Edinburgh on the Scottish leg of a British tour. 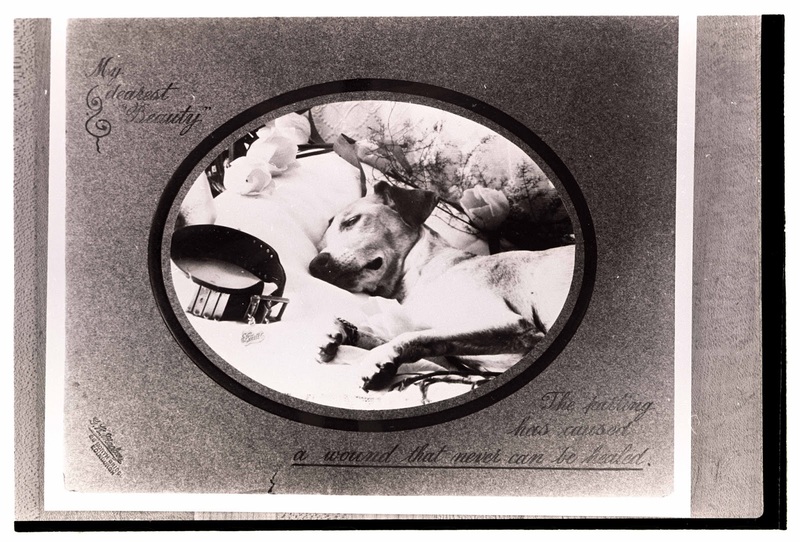 On Saturday 6 May, at their suite in the Caledonian Hotel Beauty suddenly became ill. A veterinarian was hastily summoned but before he could come to the aid of the stricken dog, she died. Beauty’s distraught master somehow persuaded the officials of Edinburgh’s Piershill Cemetery to allow him to bury a dog in a white tiled vault designed for the reception of a human being. They did stipulate however that he must join Beauty in the same vault when his term on earth finally came to a close. Neither they nor the great Lafayette could have imagined just how soon that was to be. Neuberger had his dog embalmed and laid him in state in a glass case in his hotel room until the funeral scheduled for the following Wednesday. On Tuesday evening he was back at the Empire Palace theatre in his role as the Great Lafayette, performing his pièce de résistance, the Lions Bride in which he played the role of a sultan throwing a girl from his harem into a lion’s den with a real lion. At the climax of the act the lion would pounce on the girl and then reveal itself to shocked audience be the Great Lafayette himself dressed in a lion skin. It was a complex piece of stage magic involving a genuine lion and a double and some tricky lighting. It was the lighting that let Lafayette down that night, a fuse blew, a short circuit overheated, a spark started a fire and the fire engulfed the stage so quickly that 11 people burnt to death. The audience, all 3000 of them, were safely evacuated from the building to the calming accompaniment of the orchestra playing the national anthem. The Great Lafayette’s body was found on stage, his identity confirmed by his manager and several of the cast. Despite the tragedy Beauty’s funeral went ahead as planned on the following day and further plans were made for Lafayette to follow as soon as the formalities associated with his death could be completed. But then a few hours later a further body was discovered beneath the gutted stage at the theatre, a body identified by theatre staff as belonging to Lafayette! His solicitor was called up from London to resolve the confusion which he soon did by identifying the second body as definitively belonging to his client and the first body as belonging to Charles Richards, Lafayette’s stage double in the Lions Bride illusion. Quite why no one had wondered where Richards was in the aftermath of the fire has never really been explained but all’s well that ends well and both men went to their rightful graves (we think). Lafayette’s body was taken to Glasgow to be cremated and his ashes returned to Piershill to be placed in the glass case, between Beauty’s paws, in the white tile lined vault. Dead dog; "My Dearest Beauty - the passing has caused a wound that can never be healed"
Not all of the author’s stories are quite as entertaining as this. A couple come close, the bizarre story of the burial of Lord Kitchener’s empty coffin for example, or his account, including a photo of the victim in his coffin, of the first ever recorded hit and run accident in 1905 in which the four year old Willie Clifton was left dead in the road outside his home in Hertfordshire. (The driver was eventually tracked down and prosecuted. Convicted of manslaughter he was sentenced to a mere six months in prison, so beginning the tradition of indulgent leniency to killers in cars which continues down to the present day.) The stories sit slightly uncomfortably in a rather sober account of the rise of the funeral industry professional from late Victorian undertaker to post war funeral directors. Early chapters concern themselves with the introduction of American embalming techniques in the early 1900’s, the formation of professional associations such as the British Undertakers Association and the British Institute of Embalmers, and the Cremation Society etc. We are given accounts of how the funeral industry coped during the First World War and an interesting chapter on it dealt with the Spanish flu pandemic of 1918 based on the author’s research in cemetery and undertakers records in East London. The rise of the Co-operative funeral service is given a chapter of its own and the author discusses in some detail the part played by the industry in events of national significance such as the 1920 burial of the unknown soldier in Westminster Abbey and the R101 disaster. The first part of the book closes with the Second World War. 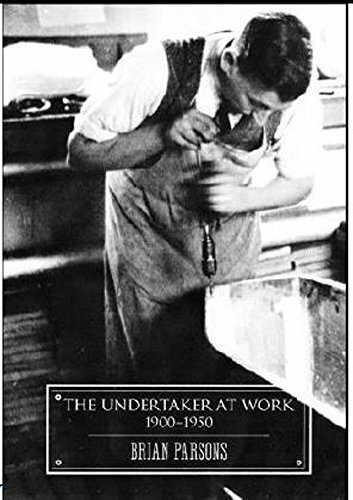 The second third of Mr Parsons book are an interesting selection from the authors collection of images illustrating all aspects of the undertaker at work, photographs of funeral parlours and other premises, coffins, horse drawn, hand drawn and motor hearses, biers, funeral directors adverts, the work of monumental masons and of funerals themselves. Brian Parsons was for many years a funeral professional and is now a consultant in the industry specialising in training and education. He has published many previous books including the fourth edition of Hugh Mellers’ definitive work on the capitals burial places “London Cemeteries; An illustrated Guide and Gazetteer.” His voice is always authoritative, he is definitely a man who knows what he is talking about, but his professional background and I suspect years of having to deal with raised eyebrows whenever he told anyone what he did for a living, have made him perhaps overly respectful towards his subject. His inclusion of the story of the demise of the Great Lafayette clearly show a man drawn to the grotesque and bizarre (and surely no one becomes professionally involved with the funeral trade who isn’t drawn to that aspect of things in some way) but this side is suppressed in order to provide a reverent account of the professional rise of the undertaking business that at times carries no more emotional resonance than would the story of chartered surveying or buildings insurance. This book is always interesting and well worth reading but I would have appreciated a slightly less decorous account of the business of corpse disposal.